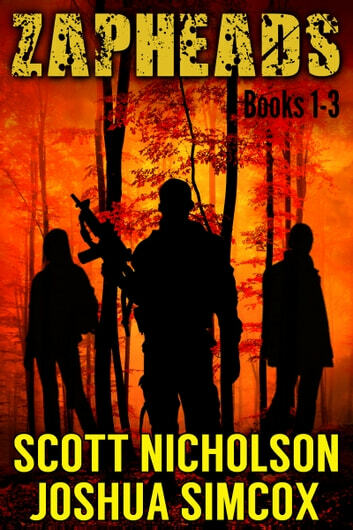 A box set of three books in the Zapheads post-apocalyptic thriller series. An AFTER spinoff. BONE & CINDER: When Mackie Dailey survives a cataclysmic solar storm that wipes out civilization and mutates others into violent killers, he seeks out the one person he cares about most. SCARS & ASHES: After a devastating solar storm erases the world they knew, Mackie Dailey and a small group of survivors build a new life on a rural college campus. But there’s another kind of evolution threatening to wipe out the remnants of the human race: bizarre mutants known as “Zapheads” who destroy anything that moves. 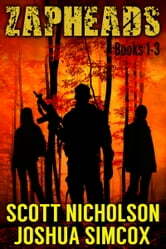 As the Zapheads adapt from mindless savages into more cunning predators, Mackie draws on his lethal skills as a former hit man to protect his new tribe. But Zapheads aren’t the only danger. Mackie’s old boss, Lucas Krider, is gunning for revenge with his own band of killers. As the campus becomes the battleground for the world’s future, Mackie discovers the biggest threat may be the monster raging inside him. BLOOD & FROST: Five months after a doomsday solar event, Mackie Dailey has settled in with a group of survivors at a remote college campus. Mackie is haunted by his former life as a hired gun for ruthless drug lord Lucas Krider, but even the apocalypse offers no escape from the past. Krider has established his own camp and preys on Mackie’s addiction and rage. Their personal battle is buried in a larger war with the mutant Zapheads who threaten the extinction of the human race. But a mysterious baby may change their world forever. Can Mackie save his friends and help them build a better future, or will he destroy them all in his quest for revenge?